Eighteen matches, three byes, away to Willy to start and at home to the the Cats to finish. Our path through the 2018 home and away season has been plotted and the challenges and opportunities therein laid bare. Upon seeing the fixture, Box Hill General Manager Daniel Napoli was excited by the season ahead. “The fixture release is always a fun time of the year,” Napoli began. “It provides signposts for the Club during pre-season and some context for our preparations on and off the field; you can look at the calendar and say, ‘there’s x days until round one’ and before you know it, it all kicks off,” he said. Whilst we don’t have to wait long for our first big test of the season – we’re away to Williamstown in round one – it’s a handful of high-profile home fixtures that immediately catch the eye. “To host the likes of Collingwood, Essendon and Port Melbourne – opponents that produced some of the most exciting and memorable matches of our 2017 campaign – is a fantastic result for us,” Napoli said. Further, once you add the visits of the Northern Blues, Geelong and Casey to that list the reasons to get down to Box Hill City Oval throughout 2018 multiply. “Pleasingly, the home side of our draw builds a compelling case for our fans to come along to Box Hill City Oval to see, experience and support our developing players, our program and watch high-quality football. 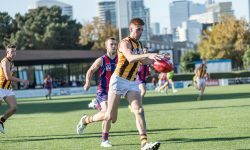 Other noteworthy events come in the form of traditional clashes with Coburg, for the ANZAC Cup, and Sandringham, in support of the Blue Ribbon Cup, which take place either side of our bye in round three and caps a challenging first quarter of the season for Chris Newman’s men. “ANZAC week is such a special time on the calendar and this season we’ll travel to Coburg for our annual match-up with the Lions in the hope of retaining the ANZAC cup,” said Napoli. “Just two weeks later, in our first home game of the season, we’re thrilled to host Sandringham in the annual Blue Ribbon Cup. In addition to byes in rounds four, ten and sixteen, our draw sees us play Casey, Sandringham, Werribee, Frankston twice. The Club also looks forward to hosting VFL and VFLW double headers in 2018, with confirmation of these dates to come when the Swisse VFL Women’s fixture is released shortly. For a full fixture graphic see our Facebook page.